ABSTRACT: Andrographolide is one of the main active principles in Andrographis paniculata .It exhibits enormous pharmacological effects. Due to this immense value it required more level in pharmaceutical to satisfy the global need. Because it present in a very low level in normal regenerated plant of Andrographis paniculata. Micro propagation is a proven method for efficient invitropropagation of medicinal plants and for commercial exploitation of valuable plant derived pharmaceuticals. Hence in this present study aimed that to enhance the andrographolide content through hairy root culture techniques and elicitation process. Hairy root cultures induced in Andrographis paniculata used for determining the effect of signal compound on andrographolide production. Methyl jasmonate and salicylic acid were used in varying concentration and introduced into the 10d old hairy root cultures. HPLC studies are revealed that methyl jasmonate at 100 mM concentration shows higher efficacy (5fold/25d) than other increasing concentrations of same. Salicylic acid shows 8 fold (100mM) enhancements than hairy root cultures (control). INTRODUCTION: Andrographis paniculata belonging to the family acanthaceae produces a pharmaceutically important andrographolide. It exhibits anticancer, immunomodulatory1 anti-inflammatory, anti-diabetic, anti-hypersensitive, antivenom, anti-thrombotic, anti-retroviral, anti-cardioprotective, anti-oxidant 2. It’s found in Asian countries, Thailand, India, china in a tropical area. Andrographis paniculata is an annual herb, chiefly found throughout the Indian plains from himachal Pradesh to Assam and Mizoram and all over south India. The conventional method of regenerated plants Andrographis Paniculatayield limited level of andrographolide. (0.7%-2.3%) 12. Micropropagation is the proven method for efficient invitro propagation of medicinal and aromatic plants and for commercial exploitation of valuable plant derived pharmaceuticals. Except few studies Praveen et al (2009) demonstrated that the use of cell cultures techniques to increase the yield of andrographolide by adventitious root culture method. Elicitation of cell cultures with signal compounds such as methyl jasmonate, salicylic acid due to their signal transduction pathway are used as wide spectrum of elicitors 4, 5, and 6. Gandi. 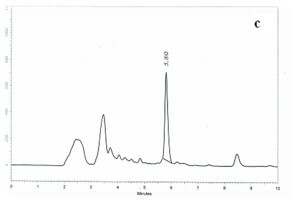 S (2012) has reported that the role of elicitation of andrographolide in the suspension culture of Andrographis paniculata. No comprehensive studies are reported that the hairy root culture methods and elicitation with methyl jasmonate and salicylic acid. Hence, the present study aimed that to enhance the andrographolide content in hairy root cultures of Andrographis Paniculataby signal compounds. Plant materials and tissue cultures: Fresh seeds of Andrographis paniculata were obtained from garden of our Bishop Heber College campus, trichirappalli, India. Seeds were rinsed in running tap water for 30 min and subsequently treated with tween 20 for 5 min. Then, the seed were surface sterilized with 70% ethanol for 1 min followed by 0.1% mercuric chloride for 3 min. After, seeds were washed 4-5 times with the sterile distilled water. Finally disinfected seeds were inoculated on MS medium supplemented with 30gl-1 sucrose for germination. The medium was adjusted with ph5.8 before the addition of 0.8% agar and autoclaved at 121º C at 15 lbs. for 20 min. cultures were incubated 26±1ºC and maintained under 16h light and 8h dark period. Agrobacterium rhizogens and hairy root culture: Agrobacterium rhizogens obtained from BDU Trichirappalli , was grown on solid YMB medium with 50mgl-1 rifampicin at 28 C and 48 h old cultures were used for infection. 3wk old germinated seedlings were infected with Agrobacterium rhizogens by making a wound with sterile needle and smearing the bacteria on the wounded leaves. Co-cultivation was carried out for 2d. Then, they were cultured on MS medium devoid of growth regulators and supplemented with3% sucrose cefotaxime 500mgl-1 and solidified with 0.8% agar (w/v). Hairy roots which developed at the end of 3wk from the infected areas were excised singly and transferred to MS medium containing 500mgl-1 of cefotaxime. Hairy roots were sub cultured every 3wk for 3-4 passages on MS medium supplemented with 250 mg cefotaxime and in subsequent passages the antibiotic was eliminated. Hairy roots obtained from a single clone were transferred to 70ml MS liquid medium in 250ml flasks kept at 40-50 rpm and used for experiments this clone was selected on the basis of fast growth the cultures were sub cultured every 3wk and used for the experiments. Preparation of Signal compound: Methyl jasmonate (Sigma, USA) and salicylic acid (HI media, India) were prepared in distilled water at varying concentration (100mM, 125mM, 150mM, 175mM, and 200mM). These were added to 10d old hairy root cultures. Both hairy root cultured sample were taken for HPLC detection of andrographolide. 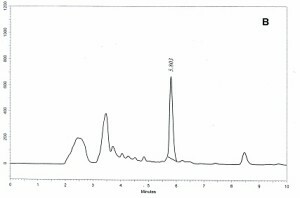 Extraction and Quantification of Andrographolide: Extraction and quantification of andrographolide in the regenerated plants carried following the method of Praveen et. al (2009). The air dried powdered samples (500mg) were extracted by mixture of dichloromethane and methanol (1:1) by cold maceration for 10 min. The extract was filtered and solvent was removed under vacuum. The extract washed 2-3 times with toluene and then dissolved in methanol. 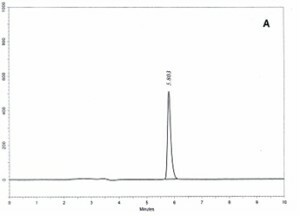 The andrographolide fractions were analyzed using HPLC, the mobile phase were acetonitrile: water (70:30), flow rate was 1ml/min; column temperature was 26°C the detector wavelength was 230nm. Andrographolide standard was obtained from sigma USA. The total andrographolide content was an average of 3 replicates. Establishment of hairy root culture: Hairy roots induced by A. rhizogenes have received a lot of attention from plant biotechnologists for the production of secondary metabolites. The hairy roots can be indefinitely propagated on a synthetic medium without phytohormones 9, 13. The main advantage of using hairy root cultures is due to their ability to grow in defined basal media without supplementation of phytohormones and due to their differentiated nature, they show genetic stability and tend to produce high levels of secondary metabolites characteristic of the species. In the present study, hairy root cultures were induced from 50-58% of cultures. Hairy root were isolated singly and grown on MS medium without growth regulators, but fortified with cefotaxime (500mgl-1) the induced roots were successfully cleared off bacteria by several passages through medium containing decreased concentrations of cefotaxime. 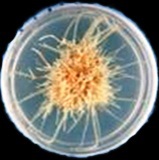 After 3-4 subcultures the root were able to grown in culture in the absence of cefotaxime and were negatively geotropic. After 4th subculture hairy roots maintained on MS liquid medium devoid of growth regulators and containing 3% sucrose were used as inoculum for further experiments. Ramesh et al (2006) has reported that azadirachitin production enhanced by the signal compounds in hairy root cultures techniques than hairy root cultures. Effect of signal compounds on production of Andrographolide: Treatment with biotic or abiotic elicitors has been a useful strategy to enhance secondary metabolite production in plant tissue and cell cultures. The induction mechanism of elicitors is generally regarded as inducing the expression of defense-related genes and activating defense-related secondary metabolic pathways10. Therefore, it is not surprising that methyl jasmonate and salicylic acid have different effects on the production of secondary compounds, since these elicitors operate in distinct plant signaling pathways and respond differently to abiotic and biotic stresses. However, elicitation is a very complex process and depends on many factors such as elicitor concentration, growth stage of the culture at the time of elicitor addition and contact time with the elicitor. In addition, the response to a particular elicitor may vary from plant to plant and between different cell lines; therefore, it becomes crucial to determine suitable concentrations of elicitors for product optimization11. In this context, we studied the effect of methyl jasmonate and salicylic acid elicitors on secondary metabolite accumulation in Andrographi spaniculata hairy root cultures. Methyl jasmonate has been shown to enhance the production of taxol and its analogues, rosmarinic acid, indole alkaloids, anthocyanin etc. in cell cultures of taxus sp, lithospermum erythrorhizon and vaccinium pahale 8, Azadirachita indica 7. In the present study , the addition of signal compounds such as methyl jasmonate& salicylic acid at different concentration (100mM, 125mM, 150mM, 175mM, 200mM) found to be a better enhancement in the production of andrographolide than hairy root cultures. 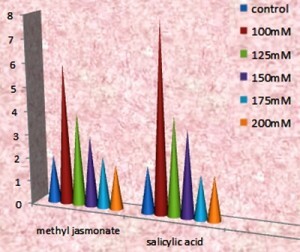 The maximum level of andrographolide obtained in salicylic acid treated hairy roots (100mM) than other concentration of same, followed by methyl jasmonate at 100mM concentration. The moderate response was observed in same concentration of salicylic acid and methyl jasmonate (125mM) when compared to the control cultures. Apparently salicylic acid was found to favor production of andrographolide compared to methyl jasmonate. Whereas increasing concentration of signal compounds inhibit the production of andrographolide. 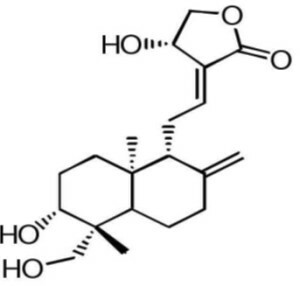 The stress produced by these signal compounds increase the active principle compound level at low concentration. High concentration resulted in loss of cell viability, and demonstrating toxic effects. Hence the results are suggested that using appropriate level of signal compounds can produce more concentration of andrographolide than hairy root cultures. It’s a pave way for the future to satisfy the commercial need of this compound in a huge level. ACKNOWLEDGMENTS: The Authors are thankful to Bishop Heber College for encouragement and support. Zid, S.A., Orihara, Y. Polyacetylenesaccumulations in Ambrosia maritime hairy rootsand cell cultures after elicitation with methyljasmonate. Plant Cell Tiss. Org. Cult. 2005; 81, 65-75. Jeong, G.T., Park, D.H., Ryu, H.W., Hwang, B., Woo, J.C., Doman, K.F., Kim, S.W. Production of antioxidant compounds by culture of Panax ginseng CA Meyer hairy roots: I Enhanced production of secondary metabolite in hairy root cultures by elicitation. Appl. Biochem. Biotechnol. 2005; 121-124, 1147-1157. Suryakala Gandi, kiranmayee Rao, Bhuvaneswari Chodisetti, Archana Giri, Elicitation of andrographolide in the suspension culture of andrographispaniculata, ApplBiochemBiotechno September 2012. Yukimune, Y., Tabata, H., Higuchi, Y and Hara, Y. Methyl jasmonate induced Over production of paclitaxel and baccatin III inTaxus cell suspension cultures. 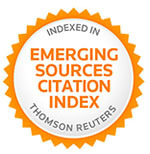 Nature Biotechno 1996; l14, 1129-1132. Doran, P.M. Hairy roots: culture andapplication. 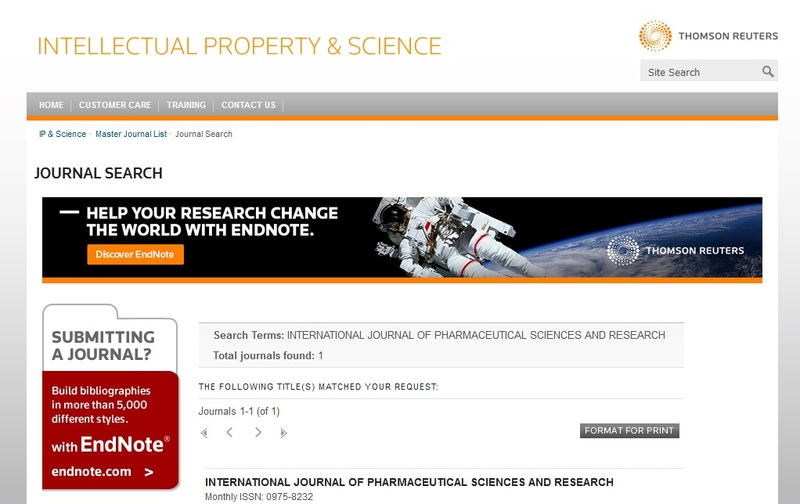 Harwood Academic Publishers.Amsterdam.The Netherlands. 1997; 1-235. Sharma, A., Singh, R. T., Sehgal, V., &Handa, S. S. Fitoterapia, 62, 1991; 131–138. Eapen, S and Mitra, R. Plant hairy root cultures: prospects and limitations. Proc. Indian NatnSci Acad. (PINSA) B67 Nos 3 & 4, 2001; 107-120. Sharmila R and Subburathinam KM: Effect of Signal compounds on Andrographolide in the Hairy Root Cultures of Andrographis paniculata. Int J Pharm Sci Res 2013; 4(5); 1773-1776.